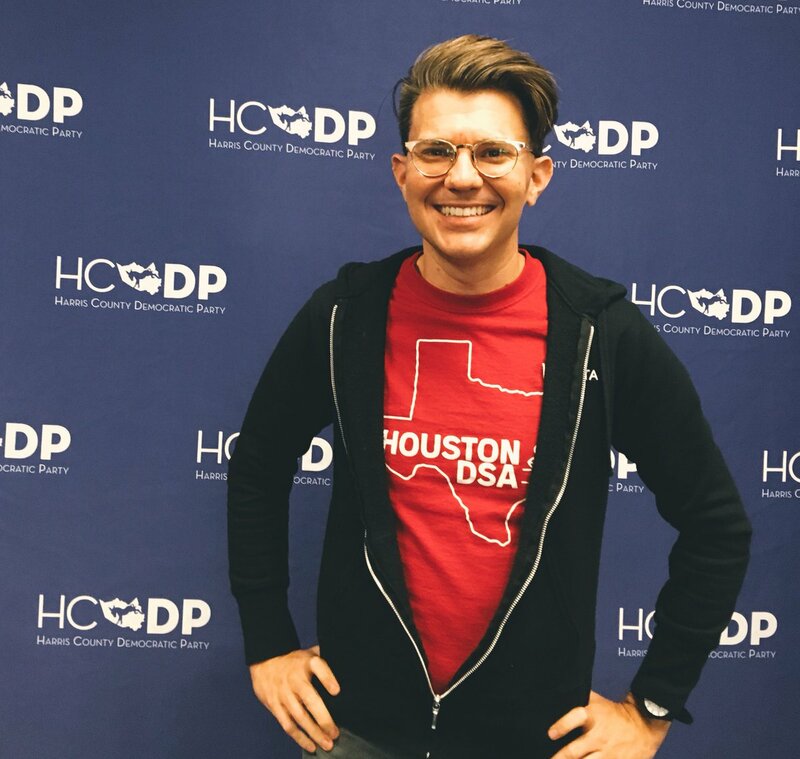 Franklin Bynum is a socialist candidate for judge in Houston. In an interview, he explains his vision for criminal-justice reform, nonprofits' attempts at co-opting reform, and why "capitalism drives the horrors of this system." That socialist threat is Franklin Bynum, a member of Houston Democratic Socialists of America and a candidate for judge of Harris County Criminal Court at Law 8. His platform includes plans to stop jailing those who can’t pay bail, an end to “plea mill” practices that coerce guilty pleas from defendants in exchange for freedom, support for diversion programs to reduce arrest, an end excessive to court appearances, and providing more police oversight in the courtroom. Jacobin’s Meagan Day spoke to Bynum about capitalism and racism’s role in mass incarceration, the nonprofit-driven co-optation of the criminal justice reform movement, the political stigma of socialism, and the definition of prison abolition. One thing you mention frequently is that you’ve never been a prosecutor. I’m thinking now about Senator Kamala Harris (D-California), who is rumored to be considering a 2020 presidential run, and her long history as a prosecutor. What is a prosecutor’s job? A prosecutor in the United States is operating one of the largest, most oppressive punishment bureaucracies in the world. I have always been acutely aware of this when I was growing up in Harris County, Texas, which sent dozens of people to their deaths every year. It’s prosecutors seeking those sentences. When I say that I’ve never been a prosecutor, what I mean is that I’ve never made that compromise, whether for career aspirations or any other reason, and that’s really important to me. By contrast, I’ve been both a public defender and a private defense lawyer who takes pro-bono cases where I don’t charge a legal fee, or charge sliding scale. I end up helping a lot of people for little or no money, and I always have. Defense lawyers of this kind deal with people who are in danger of losing their freedom and maybe their life. They need someone who’s completely committed to them. Not all defense lawyers, public or private, are capable of that — some are burned out, some are former prosecutors, some hate their clients. So not all defense lawyers are the same. One thing I do is I touch my clients in front of jurors, to show that this person is human, this person is loved. The United States has only 5 percent of the world’s population but more than 20 percent of its prisoners. We also have the most unequal wealth distribution and the highest rates of poverty in the developed world. What role does poverty play in mass incarceration? Poverty is everywhere we look in the courthouse. This is a system that for the most part does not target people who aren’t living in poverty or on the margins somehow. Defense lawyers like me are the backstop for decades of society’s failure to provide for people. For many of my clients, society never gave them a chance to begin with. No one’s ever been there for them, and then we come in at the very end of that process. The only answer that the people in power can ever come up with for social problems is more jails, more police. I try to stay away from the dollar signs because they can be distracting from the fact that this system is a moral horror, but it’s so absurd that we’ll shell out for this expensive criminal justice system, but not for anything else. By and large, my clients were not provided with some basic level of education, shelter or health care. I had a criminal trespassing case for a jury trial this morning. The government has spent thousands of dollars to prosecute my client for wandering drunkenly through a hardware store parking lot. The people in charge will spend a lot of money on police on prosecutors but aren’t willing to spend it on the basic human needs of my clients. Right. The real point of concern isn’t that the current criminal justice system is expensive, it’s that we’re willing to pay for it instead of for public education, or social housing, or Medicare for All. Yes, and also, it’s notable that people tend not to see spending on police and prisons as public spending, even though it is. I look around the courthouse and see how expensive all these cops and prosecutors and judges are. But people don’t necessarily see it unless you point it out to them. They think, of course we have to spend money this way, and it’s not the case. There’s actually a significant faction of the Right that’s purportedly interested in pursuing some agenda of ending mass incarceration. But the distinction between the Koch Brothers and us is that while they correctly see the public spending you’re talking about, they want to eliminate it because they want to diminish the public sector overall. Meanwhile we’re not interested in cutting costs, we just want to replace what we’re spending money on. For us, spending a ton of money on investing in people’s well-being would be totally justified. And then there’s another, more common group, which includes liberals and conservatives, who are trying to co-opt criminal justice reform. I’ve been making a concerted effort to talk to people in Harris County about the criminal justice system here for over a year, and nobody has said they think the system is working fine. Everyone knows it needs to be fixed. So there are now lots of nonprofits chasing hot grant money that are able to co-opt the demand for “reform.” There’s a lot of money and a lot of resources aimed at perfecting pieces of this system instead of taking it apart. Nonprofits are getting expensive contracts to come in and take over swaths of this system. For example, we know that many people are jailed because they’re poor. To address this, some experts have created an algorithm, and nonprofits want to come in with that algorithm and run part of the system for us. In return, they get big consulting money. Locally that nonprofit is the John and Laura Arnold Foundation. John Arnold is a billionaire who leveraged his Enron money into even more money in the private equity markets, and now he and his wife fashion themselves as criminal justice reformers. I think their motivation is a combination of the prestige of doing what appears to be necessary work and keeping a real danger to order at bay, preventing the thought that the whole system needs to be replaced. In a moment of honesty, I think the higher-ups at these foundations would admit that. It reminds me of charter schools, how there is this proliferation of reform-oriented nonprofits that, under the guise of taking care of the community, are essentially stemming the tide of the alternative — which in that case is to tax the rich and use the money to fund public schools. As we saw with the teachers’ strikes, things have gotten so bad that there is a real possibility of a militant upsurge if there isn’t some kind of centrist NGO intermediary acting as a stopgap. You’re so right. In the case of the John and Laura Arnold Foundation, they do operate the algorithm for determining pretrial risk here. And many judges feel that they have to do what the algorithm says because they pay for it. It reminds me of the Monorail in the Simpsons. You’ve got a problem in your community and you feel like you’re losing some power? Hey, Monorail! Right, and lucrative new revenue streams to the private sector get opened up. Like with schools, there are all these ed-tech contractors creating technology that’s pioneered in charter schools, paid for with public grant money. Oh yeah, and the tech companies lining up for criminal justice reform now too. It’s another front in the dismantling of our public sector and the privatization of everything. What role does racism play in mass incarceration, and how does that interact with poverty? They maintain each other in the sense that, for instance, you have neighborhoods segregated by race, certain ones are targeted by police, people there are marked with criminal records, which drives them further into poverty and so on. There have been all kinds of efforts to understand why police target the neighborhoods they so obviously target. Are they directed to? Or do poverty and racial oppression make people easier marks, which makes it convenient for police to get whatever benefits them in their jobs? It may be a combination of those things. But in any case, we have something called a holdover cell where people sit together awaiting trial if they’ve been in jail for a couple of days, and some mornings there’s not a single white person in the holdover cell. Sometimes I ask myself, what if this were all people of a particular religion, or some other characteristic, and I think people would be freaking out. But race in particular is a normalizing force of the worst practices of our society. I think the racial component of it is part of what allows the system to continue operating as it does. It seems to me that race functions in precisely that way. Especially when you consider that it has no biological foundation. Race is essentially a rubric for justifying, explaining, upholding, and reproducing deep inequality. Yes. Let’s go back to the holdover cell. When you’re talking about who’s left in the holdover by the morning, after everyone’s been in jail at least thirty-six hours, those people are the ones who couldn’t get out on bond. The bond is usually 10 percent of the made-up bail number that the judge invents. I’ve had many clients receive a $500 bail amount, and I ask them if there’s anyone I can call who can pay $50 to get them out, and the answer is no. So, on those mornings where there are no white people in the holding cell, that’s a combination of people color being disproportionately targeted by police and being disproportionately denied bail by their initial hearing officer and being disproportionately unable to afford to pay their bond. The latter one in particular being because of the way that people of color have fewer resources, made possible by our overall system of unequal resource distribution. Right. They reinforce each other very well. You’re a member of the Democratic Socialists of America (DSA) and you were recently endorsed by DSA’s National Electoral Committee. How long have you been a DSA member? I went to my first meeting in November 2016, like a lot of other people I’ve met over time. Before this, I had done activist work, but I’d never found a group that worked for me. I’d never been part of a group that was genuinely interested in growing a mass movement. Growing all together has really been something. Coming in from the cold, from weird Twitter or whatever alienation or social isolation we were each occupying before we found each other, there’s been some relearning of how to work together, how to even exist together. And that’s been really beautiful. Are you worried about the stigma of socialism or afraid of being red-baited? Oh, that’s already happening. The local Republican Party released a photoshopped image of me with a hammer and sickle in the background and darkened my face. But in a way I was so happy that the Harris County Republican Party, this villainous enterprise that I’ve known my whole life, is going after me. What a complement to my work! I saw that he had a fundraiser last week and less than twenty people showed, and from the Facebook photos I could see the signs propped against the wall of this suburban Mexican restaurant. Half of them were about rejecting democratic socialism. And I’m like, great, let’s get it out there that there’s a socialist on the ballot. When I talk to people, they’re not turned off by it, especially when I explain how it can improve their material conditions. People are generally accepting in my experience, and part of what this campaign is about is getting the idea out there, being uncompromising and pushing things forward. How do you define democratic socialism? People having their basic needs met, in a way that they participate in and have control over, so that they are liberated from oppression and coercion and are able to seek self-fulfillment and build a meaningful life. Why is capitalism unable to meet people’s basic needs? Life under capitalism is ordered in service of things and money, not in service of people. It’s not a democratic system, in which we control and participate in the world around us. We’ve hosted debate in Jacobin about what the term prison abolition means. Suffice to say we don’t have a consensus about this on the Left. I’ve noticed that you use it. What’s your definition? I just call it the “abolitionist movement” and put it in the larger context of movement for liberation. It’s part of the lineage of the movement to abolish chattel slavery. That movement was successful, but spawned all these other forms of oppression, and we have to continue working to dismantle those oppressions. For me, as far as a lot of these ultimate ideological questions go, such as what power the community ultimately has to punish, to banish, and so on, I think abolition is a framework of getting to those questions. As for what it will look like at the very end — not to diminish something as serious as punishment with this metaphor, but it’s like moving out of a house. There’s always more to deal with. You always think, I’ll definitely be done after this load, but there’s always more, always loose ends and edge cases. I actually love to talk and think about these questions, but I don’t want to get caught up in them. I can see things that have to stop right now. And I want to be able to go out and tell people that I’m part of an abolitionist movement that is not just trying to get a cushy contract to implement some reforms, like the John and Laura Arnold Foundation. I want fewer arrests, fewer people in cages, fewer families separated today. What we have today in terms of our jails and prisons cannot exist. Sometimes when I look around them I like to imagine them as a museum. People won’t believe we did this someday. I think we will come face to face with these big questions when we start to successfully replace capitalism. But until then, capitalism keeps generating more people to put in cages and more cages to put them in. The capitalist demand for growth is so toxic when you apply it to a punishment system. Because in this context, growth has probably the worst possible social cost imaginable. Yeah, under capitalism every single economic actor is compelled to operate by the dictates of the market. And it’s one thing when it’s businesses in competition with each other to make and sell shoes, but it’s quite another when you have private sector opportunism in the prison system — not just in the form of private prisons but also contractors, firms, and vendors that feed like parasites on the host of the criminal justice system. Here in Harris County you see that all the bail-bonds companies have all of these funny names in an attempt to be listed first in the Yellow Pages, like AAA Bail Bonds, #1 Bail Bonds. But if you go to the bail-bond board, you can see a list of where their funding comes from. I’ve seen it and it’s Lloyd’s, it’s Travelers, all of these insurance companies. When I saw that list for the first time, something turned on. A judge can drive up those insurance companies’ revenue with the stroke of a pen, by like arbitrarily setting a $30,000 bail. So that incentivizes these companies to get involved in politics and work behind the scenes in ways that are totally unaccountable. You can see in that example how capitalism drives the horrors of this system.